Chichen Itza is one of the most visited archeaological sites in Mexico and the ruins are classed as a UNESCO World Heritage Site. 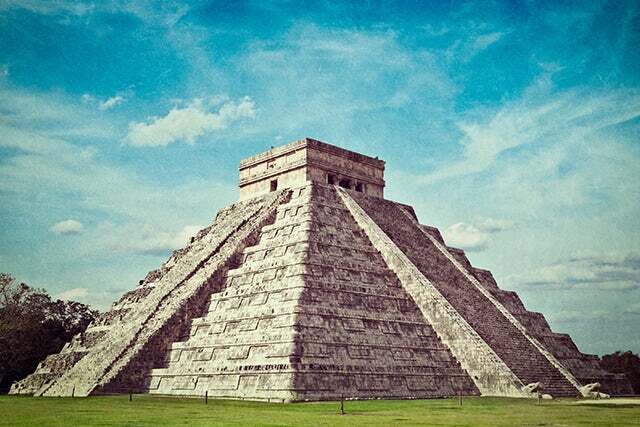 Chichen Itza is the most spectacular, best known and well-restored of Mexico's ancient archaeological sites. The complex was named one of the “New Seven Wonders of the World.” The ruins at Chichen Itza cover an area of 6.5 sq km (2.5 sq miles) and can easily be toured in a day. Chichén Itza’s most impressive sights and structures are located in the central zone. Here you’ll find the Juego de Pelota (Ball Court), several platforms, temples and the spectacular El Castillo (Pyramid of Kukulkan), a massive 25m stone representation of the Maya calendar. Toltec warriors are represented in the carvings around the doorway at the top of El Castillo. If you are lucky enough to be here during the Spring or Autumnal equinox, you can see the late afternoon light cast the illusion of a serpent ascending or descending the steps of the Pyramid of Kukulkán, a fantastic phenomenon that attracts huge crowds. The illusion is reproduced at the sound and light show that takes place nightly at the archaeological site.